A dental crown is a fixed prosthetic oral device. Crowns are cemented onto existing teeth or implants and must only be removed by a dentist or prosthodontist. A crown mimics the shape, functioning and texture of a natural tooth and can be placed over a damaged tooth or another oral device. A crown is made out of a porcelain or a metal alloy or a combination of the two. Usually, your dentist will need to resize a tooth to ensure the crown fits over it. Your dentist will take an impression of your newly sized teeth or implant, where the crown will be placed. The impression is sent to a dental lab to create the crown. A temporary crown may be put in place while the impression is made. When the permanent crown is ready, the temporary crown will be removed and the crown will be set and secured over the existing teeth or oral fixtures. This may take 1 - 2 weeks. 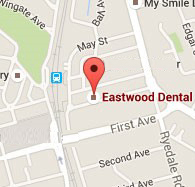 At Eastwood Dental with the CEREC Cad Cam, we are able to make a porcelain crown in one visit. Bridges are fixed prosthetic oral devices that are not removable. They are cemented onto existing teeth (or implants) and should only be removed by a dentist or prosthodontist. Bridges are used to cover or replace damaged, missing or undesirable teeth. Unlike crowns, bridges replace more than one tooth. A dental bridge will thus occupy the space where the damaged or missing teeth once existing teeth. Dental bridges are usually made of two dental crowns that are joined (or bridged) together with one or more false teeth. Usually porcelain or ceramic materials are used, which mimic the look and texture of your natural teeth. There are an array of other materials available which may be more aligned to your financial or functional needs. Before a dental bridge is attached, any existing teeth will be reduced in size so the bridge can fit over it or an implant will be attached to your jaw-bone. Your dentist will then take an impression of the newly sized teeth (or implant). A dental lab will use this impression to create the bridge in the material that is best suited to your needs and budget. Usually a temporary bridge will be put in place while your permeant bridge is at the dental lab and will be removed by your dentist once your permanent bridge is ready. Your dentist will then fix the bridge over the prepared teeth or oral fixtures. How long will my crowns and bridges last? Generally, crowns and bridges will last a very long time depending on which materials were used and how well you care for your teeth. It is essential you maintain effective oral hygiene and habits as bridges can loosen if the teeth holding or surrounding the device are damaged by dental disease. It is essential you review and know how to correctly clean your bridge through regular check-ups.